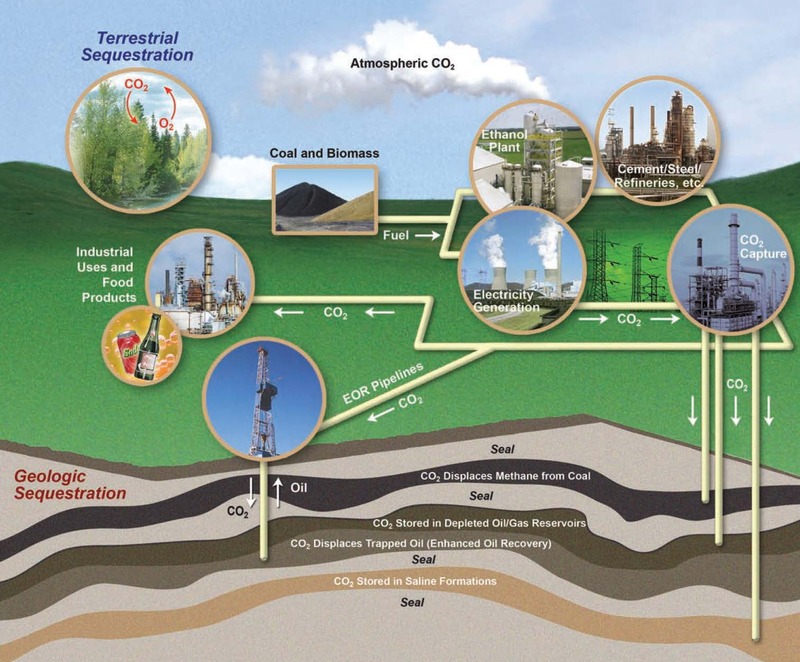 Carbon capture and storage (CCS) is the process of capturing and storing carbon dioxide, or CO2, that is produced by human activities. Most of this CO2 is formed by the combustion of fossil fuels, primarily petroleum and coal. 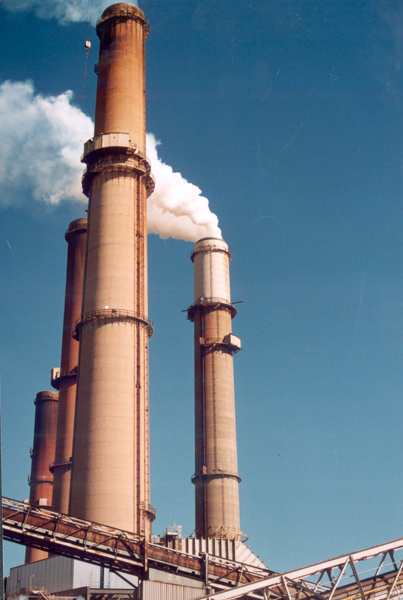 The process of CCS prevents the release of this greenhouse gas into the earth's atmosphere where it would accumulate. Geological sequestration, or geologic carbon storage, is a type of CCS that uses the natural trapping ability of the earth's deep subsurface environment to store CO2 that has been injected into that realm. CO2 is initially captured from a place where it is created, such as a fossil-fuel-fired power generation facility, oil refinery, cement kiln, or ethanol plant. At such point sources, the CO2 is concentrated enough to make the separation and compression of the gas feasible. The gas is then transported by pipeline to a geological sequestration site for injection and confinement. Specific conditions are required within the deep subsurface geological environment to effectively store the injected CO2. These include a porous and permeable reservoir, an impermeable seal or confining unit overlying the reservoir, and adequate depth to contain the CO2 as a dense fluid, in what is termed a "supercritical state." The CO2 must be stored where it cannot migrate out of the storage reservoir into other subsurface resources, including groundwater and other mineral deposits that might be used in the future. The emplacement and storage of large volumes of CO2 into a storage reservoir must be effective for a very long period of time; slow leakage back into the atmosphere would negate the value of the practice. Injection into a hydrocarbon-bearing strata such as an oil or gas reservoir, a gas shale, or a coal seam. In each of these reservoirs the effort of storing the CO2 in the pore space of the rock is accompanied by the process of pushing out hydrocarbons, either oil or gas, for production at the surface. In both types of reservoirs, details about the geology and the unique processes that take place within the storage zone must be carefully investigated and understood for the sequestration process to be effective. Much of the information about these reservoirs and their accompanying seals that is necessary for building this understanding can be derived from existing investigations about the deep subsurface environment. Oil and gas fields and other deep subsurface operations, such as waste injection systems, provide essential information about the rock strata necessary for designing and operating a sequestration system. Careful documentation of the context of a sequestration operation is also necessary; both in the subsurface and on the surface. The impact of the injection process includes the construction of pipelines and wells that must be properly sited. The operational conditions of the sequestration system need to be designed and implemented to accommodate the strength of the rocks in the reservoir, seal, and overlying rock column. Injection pressures, well spacing and construction specifications, and CO2 volumes must all conform to the geological characteristics of the area where the project is sited. To ensure that the operations during and after the injection phase of the sequestration project function appropriately, a suite of practices collectively known as "monitoring, verification, and accounting," or MVA, are applied. These MVA practices involve using technologies and procedures that monitor the observable aspects of the sequestration process, verify that the operation conforms to the design specification, and accounts for the amount of CO2 stored in the reservoir. All these processes are necessary to assure that the sequestration process is safe, effective, and can be validated well into the future.